Belonging to the red algae family, beard algae (also called brush algae) grows on the edges of plant leaves as well as on the edges of almost any hard surface. Composed of very fine strands or tufts, it grows in dense patches resembling a dirty green beard, thus earning its name. It can also be bright green, blue-green to blackish green. It is soft, slippery, and grows rapidly, yet clings tenaciously to plants and cannot be easily removed by hand. It is eaten by only a few fish, notably the Florida Flag Fish and the Siamese Algae Eater (Crossocheilus siamensis). Perhaps the number one cause is unstable or low levels of carbon dioxide. When CO2 is unstable, plants can't use the fertilizers and light available to undergo photosynthesis, and that kind of environment is a hospitable one for beard algae. In that case, supplementing CO2 supplementation is likely required. Beard algae most often enter the tank on contaminated plants. However, even small free-floating strands in a bag with fish are enough to start its growth in your aquarium. Affected plants can be soaked for two to three minutes in a 10 percent bleach solution to kill any algae on them. (Never pour bleach into an aquarium!) Completely remove heavily affected leaves. Bleach rocks, gravel, and any other items that exhibit growth of the algae. Stock the tank with a Siamese algae eater (Crossocheilus siamensis). Note: Be sure to purchase the proper species, as many species of fish are sold under the name of Siamese algae eater. Other species of fish do not eat beard algae. If other options fail, treat with copper according to manufacturers directions. However, copper can have adverse effects on certain plants as well as fish and should be used with caution. Follow a strict plan for tank maintenance weekly. Changing the water weekly is necessary to replenish lost minerals and to stabilize the pH to avoid an environment that's overly acidic. Clean debris consistently and don't overfeed. When beard algae attach in the tank, it can be difficult to separate it from the gravel, glass, and silicon seams. It requires a lot of elbow grease to remove it from hard surfaces. Try a toothbrush, magnetic scrapers or razor along with a spray treatment like Seachem Excel or Metricide. Prevention is the best course of action. 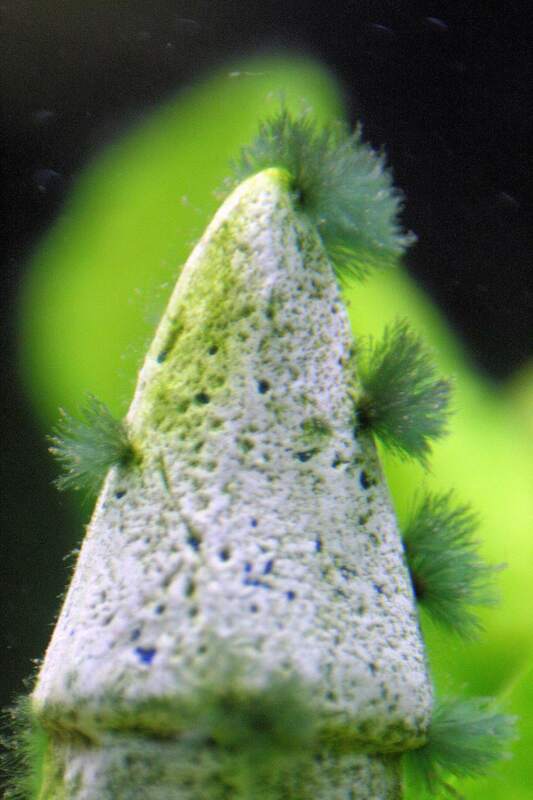 Once beard algae start growing, it will very quickly cover everything inside the aquarium that doesn't move. On plants, it can block the light and actually stop photosynthesis, which will result in the plants' death. To avoid algae entering the tank via fish, quarantine new fish for at least two days. When placing them in the tank, net the fish rather than dumping them out of the bag, so no bag water enters your tank. Soak newly purchased plants prophylactically for two to three minutes in a 10 percent bleach solution to kill any algae on them. Also, purchase plants and fish from a reputable local fish store.